XJ heralds British-built bonanza | What Car? The Aston Martin Rapide will be the first production four-door car from Aston Martin, but will still deliver the marque's core values of elegance, high performance and luxury. The aim is to ensure that there is an Aston to satisfy 'every kind of sports car customer', according to chief executive Dr Ulrich Bez. 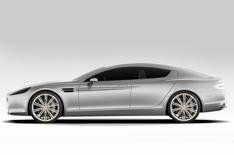 The Rapide will be based on a stretched version of the company's existing aluminium underbody architecture, provide four-person space and luggage capacity. It will also impress with 'swan' front doors that open upwards and outwards simultaneously. A 470bhp version of Aston Martin's 6.0-litre V12 engine linked to a six-speed automatic gearbox will provide power for the new car. The Grand Bentley is coming - click here to enlargeThe name Grand Bentley is merely a working title for a car that sets out to recapture the grand touring spirit of the 1920s, when the Bentley Boys a group of sportsmen and bon vivants won the Le Mans 24-Hour race five times. The car and its name will be revealed at the Pebble Beach concours d'elegance in Monterey, California, in August. Bentley is a featured marque at the event in honour of the company's 90th anniversary. From the teaser pictures so far revealed, the new Bentley will be a mega-luxury offering to replace the Arnage and sit above the Continental range. In keeping with its grand touring brief, it is expected to use an updated version of the company's 6.75-litre V8 engine. The Ghost is designed to give Rolls-Royce something nearer in price (although not exactly close) to Bentley's Continental Flying Spur. It goes into production in a few weeks and is expected to start at around 170,000, compared with 264,000 for the Phantom range. Rolls-Royce says the Ghost will deliver peerless levels of refinement and comfort with a new level of 'dynamic vitality' thanks to an integrated chassis system with air springs at all four corners. The car is loosely based on the platform used by the latest BMW 7 Series, including its active roll stabilisation and variable damping control systems, although about 80% has been modified to ensure a unique R-R character. Power will come from a 6.6-litre 600bhp twin-turbo V12 engine mated to an eight-speed automatic gearbox.